Palestinian writer Huzama Habayeb has been announced as the winner of the 2017 Naguib Mahfouz Medal for Literature for her novel Makhmal (meaning velvet in English). 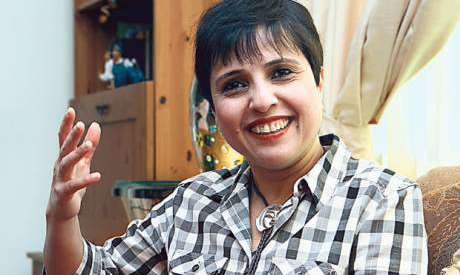 Habayeb, 52, is a Palestinian writer and poet, she was born on June 4, 1965, in Kuwait. She is residing now in the UAE. The announcement was made at a prize ceremony at the American University in Cairo. Last year, the award went to Egyptian writer, Adel Esmat. The prize is awarded annually on 11 December, Mahfouz's birthday, and consists of a silver medal, a cash prize of $1,000, and an English translation and publication of the winning novel by AUC Press. Novels are eligible if they are published in Arabic but do not yet have an English translation. The Naguib Mahfouz Medal for Literature is sponsored by AUC Press, the publisher of some 50 Naguib Mahfouz English-language works. The publisher carries around 200 titles of Arabic literature in translation in its catalogue. In 2015 the award went to Lebanese writer Hassan Daoud, and in 2014, it was awarded to Sudanese novelist Hammor Zaida. And in 2013 it was awarded to renowned Syrian writer Khaled Khalifa. In 2012, Egyptian writer Ezzat El-Kamhawi won the award. Among previous winners of the prize are Egyptian novelists Edwar El-Kharrat and Yusuf Idris, Ibrahim Abdel Meguid, Latifa Al-Zayyat, and Palestinian poet Mourid Barghouti.